Mixing comedy & horror is a dangerous combo…a bit too much of either & the end product is often found to be lacking. Thankfully that isn’t the case with Idle Hands, it gets the blend perfectly right. Anton is a teenager who spends his days & nights getting high on weed, sleeping & generally doing as little as possible. To say he is lazy is an understatement…he is so oblivious to events surrounding him that he doesn’t even realise his parents have been brutally murdered a few days before. Things get worse when, against his will, he murders his two best friends, Pnub & Mick, another pair of stoners who live across the road. Yeah, you read that right…against his will. Anton’s hand has become possessed & has murderous intentions for everyone but especially his love interest, Molly. To make matters worse for Anton, Pnub & Mike decided to not go to heaven (the walk was too far) & have returned to their bodies. Trying to get his hand under control Anton discovers that the possession is related to the old saying ‘idle hands are the Devil’s play-things’. Anton, being the laziest teenager in the entire world is now cursed & at midnight his hand is going to take Molly’s soul into the netherworld! It’s a thrilling story with incredible pacing…early on (once the possession is revealed) you start to wonder if the movie has blown it’s load too early but it keeps the action rolling & the laughs coming. A lot of this is because of the fantastic acting. 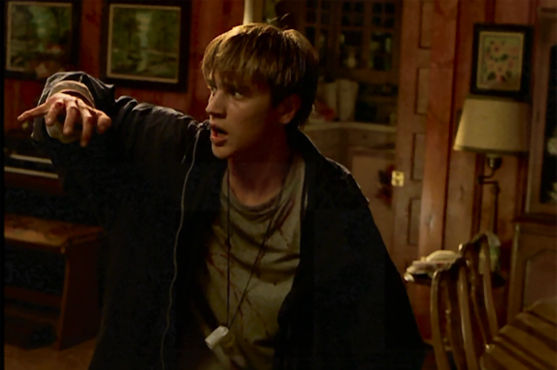 Devon Sawa is brilliant as Anton, very convincing as he tries to get his hand under control. 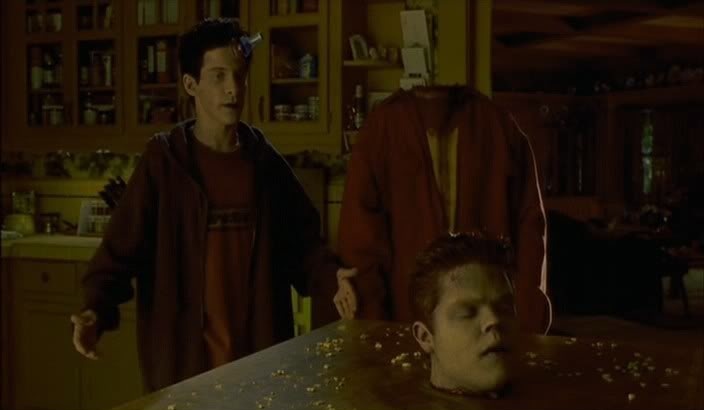 The same can be said for Pnub & Mick (Elden Hensen & Seth Green) managing to be convincing & hilarious at the same time. They drive the movie on with their funny interactions & silly behaviour in relation to being dead. However, the real star of the show is the hand, it’s pure evil behaviour is exciting especially when severed from Anton’s arm. It is able to show more personality without saying a word then Jessica Alba manages to show throughout the entire movie in the role of Molly. Yeah, she is easily the worst thing throughout playing her role far too seriously for a movie that has its tongue firmly planted in its cheek. Every time it seems to be slipping into ‘American Pie’ territory it shocks with a sudden outburst of extreme violence & gore. It’s a lot fun & you’ll find yourself gleefully grinning along as another character gets decapitated or beaten to death by the evil hand. 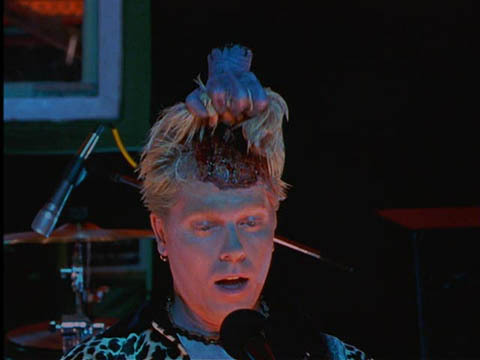 It is a movie of the 90’s, I mean The freakin’ Offspring are in it during the school party (a little bit of Carrie going on there too) & lead singer Dexter Holland gets scalped! Disappointingly the ending is a bit too nice, a bit too perfect, lacking impact & losing the comedic edge that had been present through most of the entire movie. 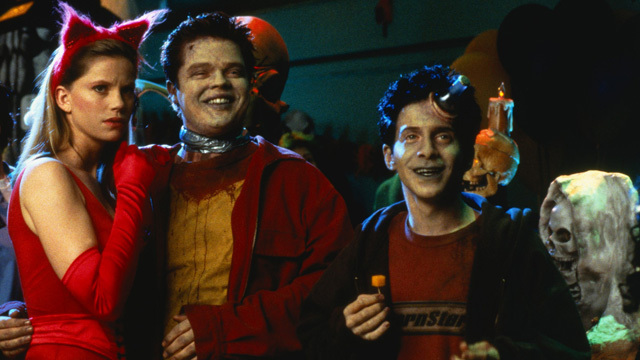 Amazingly Idle Hands was an absolute flop at the time but has built up a cult following over the years. It is an absolute blast combining comedy & horror perfectly.